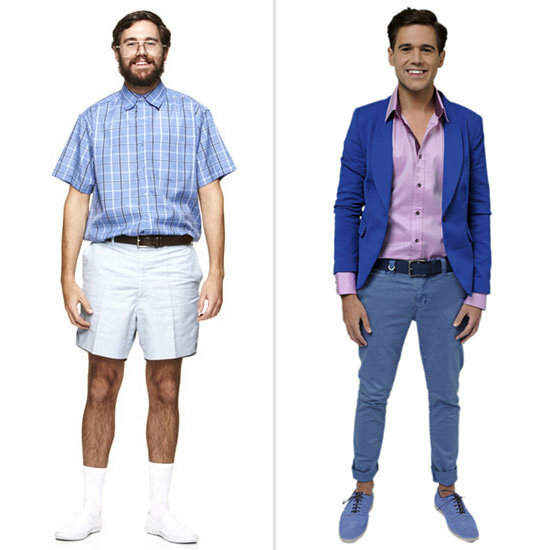 Guys have a really hard time when it comes to buying the correct size clothes. I see it every single day. Most dudes just don’t know any better so they always pick a bigger size than they need mainly because it seems more comfortable. I would argue that correct size clothing is even MORE comfortable. 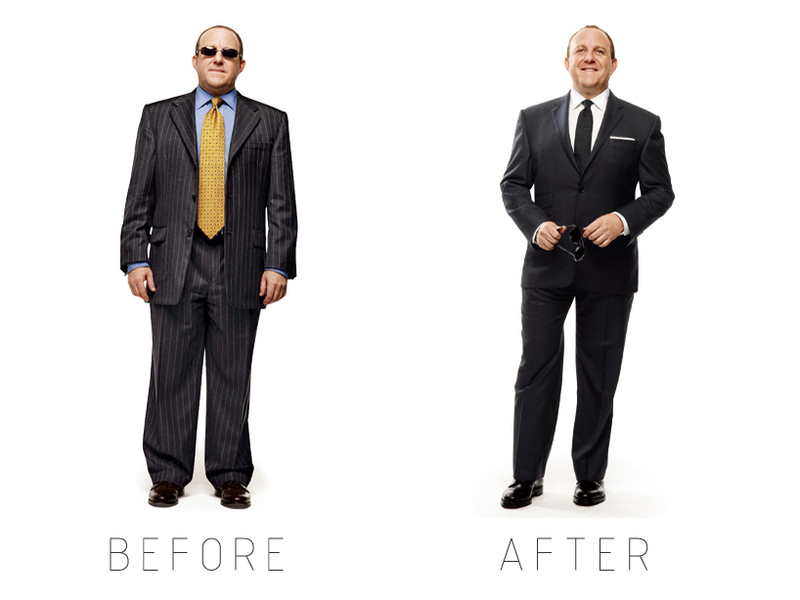 Not only that, but correct size clothing can shed pounds off your frame making you look slimmer and taller. Don’t believe me? Look that the image above. Okay, say for example you’re carrying around a few extra pounds. My guess is you probably wear over-sized clothing trying to hide those pounds. 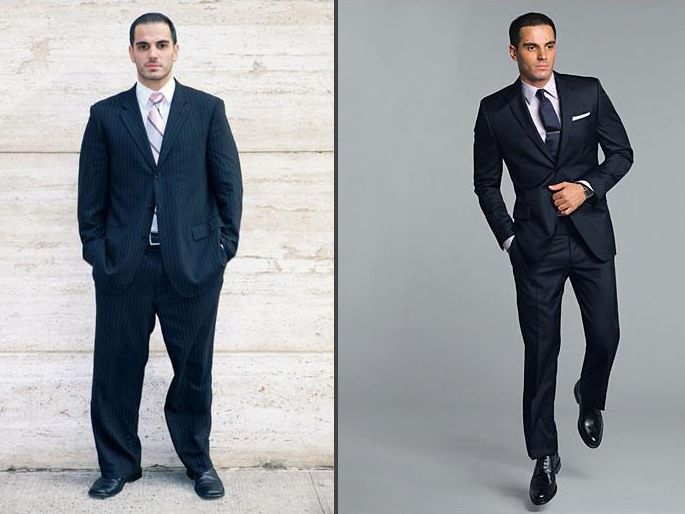 The problem is, larger clothing makes you look even larger than you actually are, so you’re doing more harm than good. The extra fabric drapes off of you creating a boxy shape instead of helping to contour you. 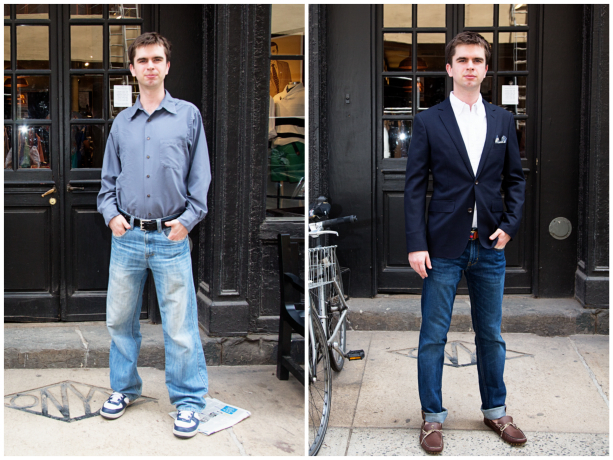 In the “Before” shot above, you can see how big the jacket is and how wide and long the trousers are. This is making him look short, wide and dumpy. 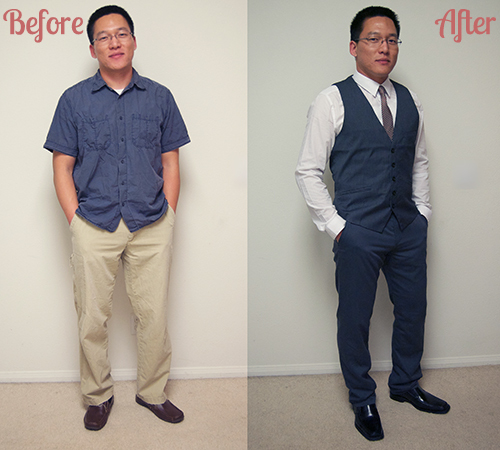 Just by switching to a more fitted cut, he instantly looks long, lean, and also more polished and confident. His clothes aren’t tight, just all the extra billowy fabric is gone. Here’s a guy with the opposite problem. He’s a skinny dude wearing oversize clothes probably trying to make himself look bigger. Problem is, it just makes him look sloppy. 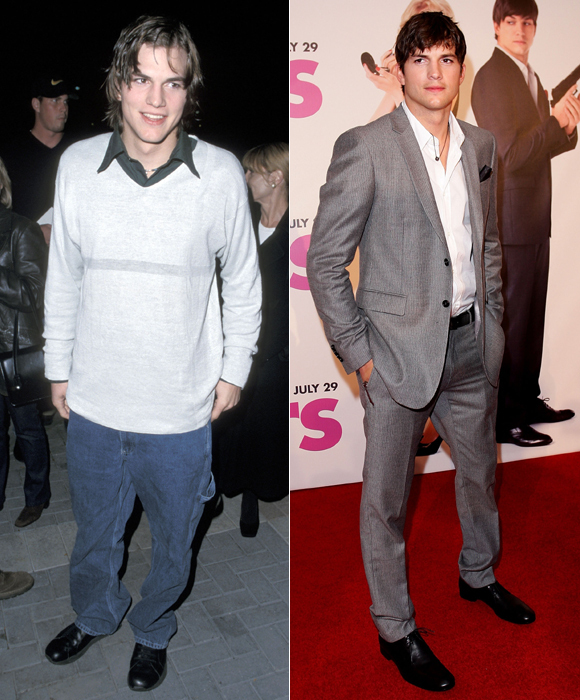 By choosing better fitting and more grown-up options, he looks taller and much more put-together. I love this next example. 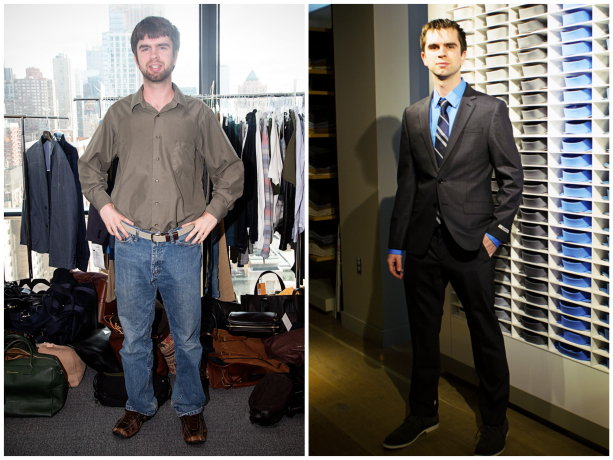 It looks like this guy just lost 50 lbs! 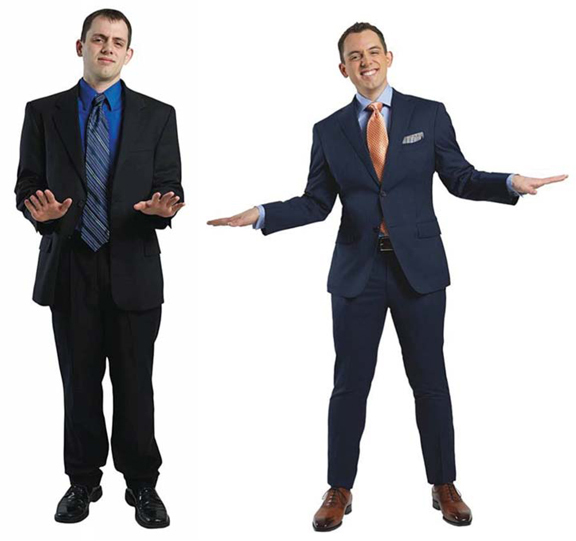 Same exact guy wearing two different sized suits. I hope by now you’re starting to understand how your choices in clothing can make a huge impact on how you present yourself to the world, and how the world sees you. You may be nicest guy in the world with amazing things in store, but the world can’t see that. 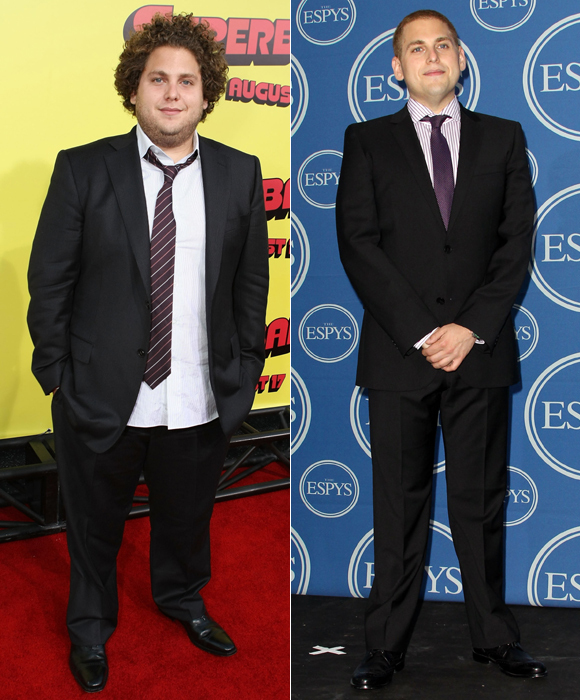 Here’s a few shots of Jonah Hill. 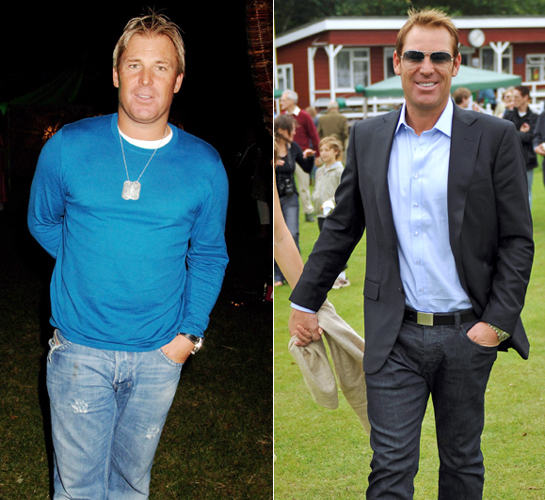 Granted, he’s lost a lot of weight, but his previous clothing options weren’t doing him any favors. I really hope you’re starting to see and understand the points I’m trying to make about finding the right fit and how much of an impact it can make. Here’s a few more examples for you.